The Cruze exposed round thermostatic bar valve with bottom outlet is part of our contemporary collection of bathroom products. 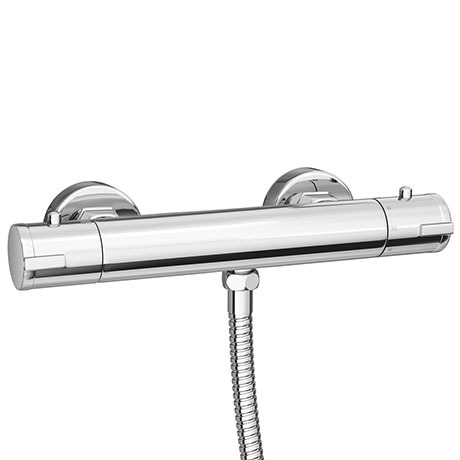 Modern styling with chrome finish and constructed from solid brass, the Cruze bar valve has two controls, one controls the flow and the other controls the temperature. Featuring the latest anti-scald technology, the valve is pre-set to a safe and optimal 38°C, this can be easily offset by holding down the safety push and click button on the handle. Supplied with decorative shrouds/covers to protect and conceal tile/wall edge, giving the installation a neat finished appearance. Designed to be used with a slider rail kit (not included).